Caught this rebuilt GP9 at Ephrata back in October of 1993. It was notable for being the last locomotive to be rebuilt in the Hillyard shop before it closed down. It had been wrecked while on the Camas Prairie, where it had spent most of its life after having been bought by the Northern Pacific for service there. After having been rebuilt, it was considered a better locomotive than when it was new. 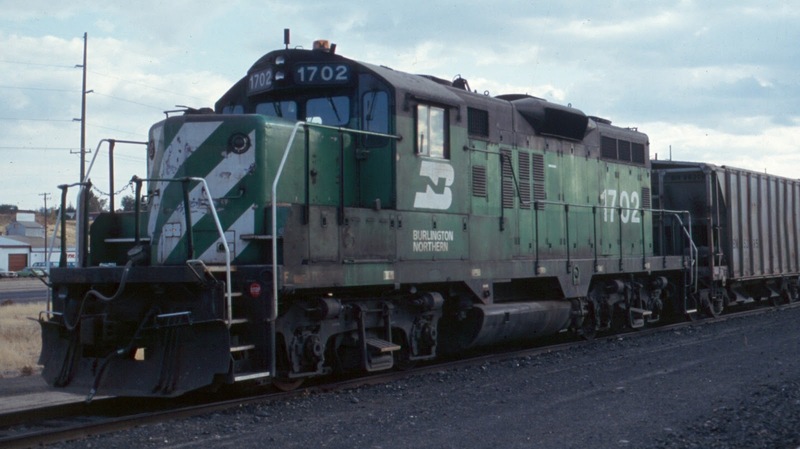 After the BNSF merger, it got the orange and green paint and the number 1600. It was one of the last GP9s on the system when stored, out of service, in Tacoma a few years back. Before being sold BNSF relettered it with Great Northern reporting marks.